It is about to get much easier to find a business in Oak Park. Oak Park businesses will find a postcard in their mailbox this week announcing the Chamber's "Building Better Business Districts" project. In partnership with the Village of Oak Park, the Chamber of Commerce has been working since July to build a public online directory and a central resource for business information. The project utilizes the Chamber's existing technology to pull together each business's name, address, contact information, website and type of business into a central database. The database fuels the online directory, allowing anyone to search through the Chamber's website for a business by name, business district location or category (restaurant, retailer, printer, doctor, etc.). Currently, there is no other online directory to do that save global search engines like Google or Yelp. The backend of the database project is just as useful. Using the centrally-housed contact information, the Chamber will be able to send relevant information directly to the business owners. We'll enable communication both ways, with online survey tools in place to collect feedback from businesses on particular issues and a point of contact for businesses to email with questions or concerns. The Chamber is working closely with the hyper-local merchant associations we call "business districts." The volunteer-led business districts, like the Arts District, Hemingway, North Avenue and Southtown, work to create neighborhood business communities and street-level vibrancy. Local events such as festivals and sidewalk sales as well as holiday lighting and local advocacy fall under the purview of these organizations. The Chamber's "Building Better Business Districts" project supports these organizations, as well as the professionally managed Downtown Oak Park through the village-wide online directory, communication tools and other back office functions. The central calendar will fill a real need in the community. Today, we need the businesses themselves to participate by validating their information and learning how to update it. Businesses, expect snail mail and email soon alerting you to the project and next steps. Your Chamber of Commerce is very excited to help connect businesses in Oak Park to customers, each other and the Village. Merchant Associations are common in retail and shopping districts across the country. These member-based organizations bring together local merchants to organize retail events, join forces to split advertising costs, share the cost of holiday decorations and lobby the municipal government for street scape improvements and incentives. 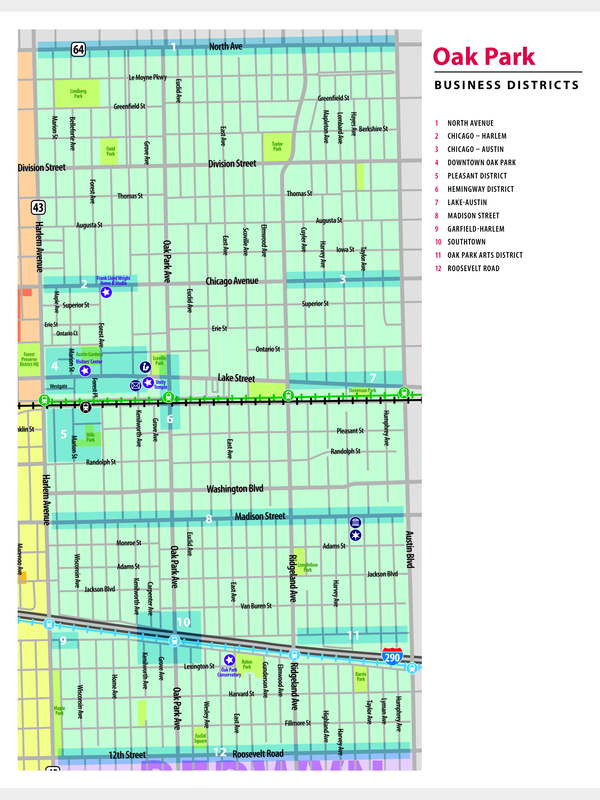 In Oak Park, there are twelve merchant associations are known as "business districts." River Forest has not yet officially organized its retail areas, but refers to the three areas a "corridors." Most of the focus in Forest Park is on Madison Street, but there is a vibrant business district on Roosevelt as well. For more in depth information, read the 6-part series on how our local business districts function in the "The Business of Business Districts Series" on the Chamber's blog.